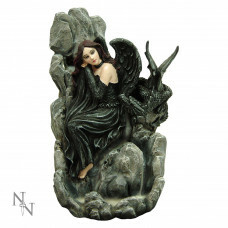 Sitting on a stony ledge, this Fairy is in deep contemplation as her Dragon companion peers at her from below. A beautiful and perfect addition to anyone's collection. The Incense can be placed behind the rock above her head which allows the smoke to cascade down to form a pool below the Fairy's feet.